Thomas Gardner of Salem, MA: Where is Thomas? The problem of 'Where is Thomas?' was asked earlier. Answering that question seemed to be a reasonable task to attempt to accomplish. 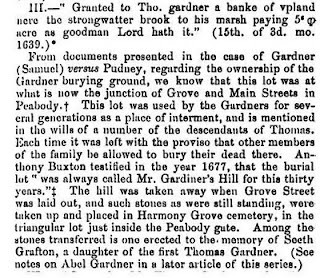 Dr. Frank mentioned a 'Gardner burying ground' (pg 11) that had passed through several hands over the years. One thing of interest might have been following all those transactions using the maps from several points in time. Dr. Frank said that Thomas was buried on these grounds as was Seeth, his daughter. Too, grandson Abel, and his wife Sarah Porter, were there. It might be of interest to collect other names. I spoke today, by phone, to the Harmony Grove Cemetery and learned a little about the graves that were in the area of Boston and Grove (in Salem). Dr Frank said Main and Grove, but we know that these types of boundaries move about. According to Harmony Grove records, the graves were moved, sometime in the 1840s. According to Dr. Frank, this was to allow for Grove to be put in. After the phone discussion, I remembered that there is an ongoing effort to document grave information to allow internet search. Sure, enough, Thomas is on the list along with Abel and Sarah. Gosh, isn't the Internet great? This seems to be an effort, like Wikipedia, where volunteers put in the information. Thomas "The Planter" Gardner -- the writeup includes links to one of the pages about Thomas plus to a 1692 map of Salem. Dr. Frank mentioned that the burial ground was near Strong Water brook which would have been the south side of the area marked Northfields. We need to find out about Seeth and others who may have been there. 10/25-26/2018 -- With a new twist, as bodies and stones were also moved to the Trask site. 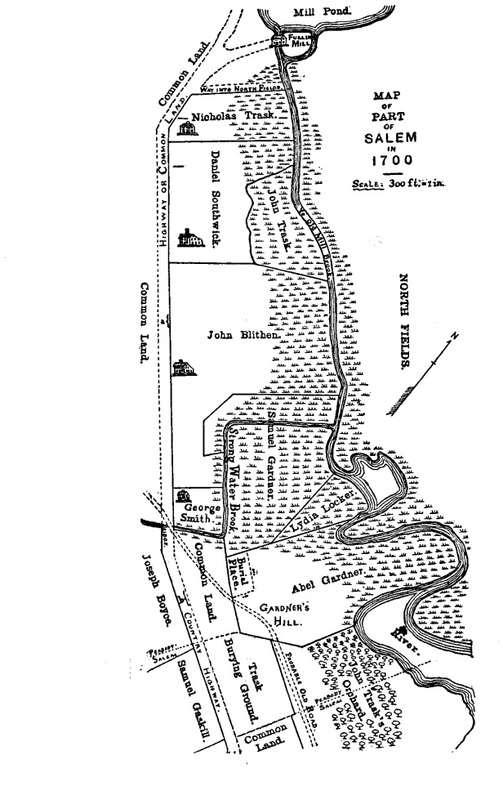 Add in Sidney Perley's map of Gardner Hill. 06/26/2015 -- Where was and is he? 05/22/2011 -- Thomas is somewhere in this area. 10/01/2010 -- Too, where is Margaret? Also, we need to pinpoint the exact location within the cemetery for these graves, and stones.